Healthy Breakfast Muesli or Granola? 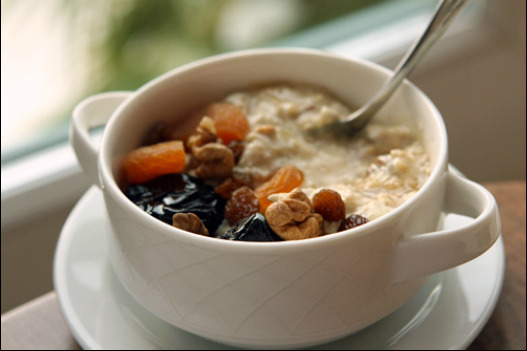 Commercial muesli is a great healthy breakfast, or is it? Traditionally, it's a dry cereal made from whole oats (sometimes plain rolled oats and sometimes toasted), nuts, fruit, seeds and wheat flakes. But dry, uncooked cereals are not that easy to digest for many people, even when they've been toasted. These days there are many versions, including gluten-free muesli, fresh muesli (soaked overnight in water, milk, yogurt or fruit juice to soften and aid digestion), toasted or un-toasted muesli, and its closest relation, granola. 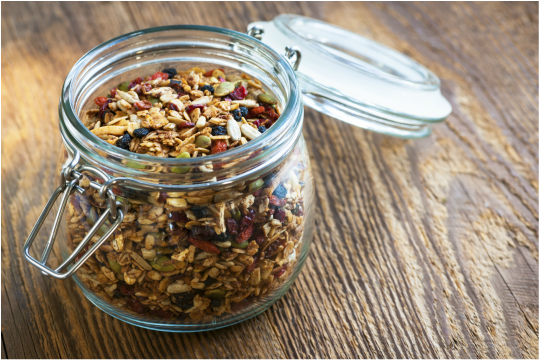 Muesli usually contains fewer carbs because when making granola, you add some honey or syrup to bring the ingredients together in little clumps. Your first experience may well have been with the Alpen brand for example, but the problem is - it's loaded with 70% carbs per 100gm. These are the golden rules; please remember that the exact recipe matters less than what your taste buds judge to taste best. Making the Swiss version, Bircher Muesli? Soak your ingredients overnight, which builds taste and aids digestion; it’s soggy, not crunchy, but has a charm all of its own. Eating it with good quality yogurt is a plus-point too but what is it that makes store bought muesli unhealthy? On examination, you will find that the packaging looks healthier than the actual contents inside the box and note that almost all commercial brands of muesli and granola are actually laden with extra sugar. They're generally high in carbs (because cereal crops such as oats, wheat and barley, are that much cheaper than nuts and seeds) and contain certain questionable ingredients to assure a longer shelf life. While it is true that these days, there are 'healthier options'… they still contain preservatives and are high in carbs... So why don’t you make your own? It’s simple, and you just need to decide on your favourite taste and colour which can range from a kind of crunchy muesli to a full blown toasted granola mix… albeit with far less sugar and few if any carbohydrates coming from cereals. 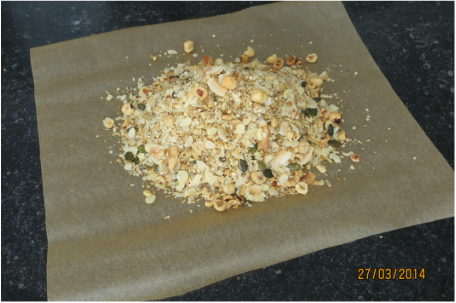 The idea is to mix your low-carb selection of nuts and seeds before toasting them in a thin layer on a tray lined with baking paper at 140 degrees C in the oven for 30-40 minutes, stirring them twice after 15 and 25 minutes. Wait till you have just the right warm colours and let cool down with the oven door open. Don't cook for too long or the more delicate coconut flakes will burn. nb: buy ground flax seeds or grind your own in a coffee grinder to get the Omega-3 nutritional benefit. Kept whole, they mostly just pass through you - but they are crunchier, so that's what I do! 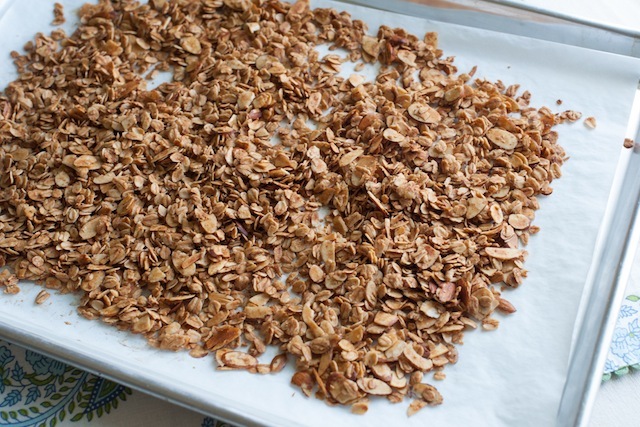 Now the only way to get that authentic granola look is to add something sticky and roast your mixture for around 10 minutes longer before leaving it to cool. That something sticky can be honey or maple syrup for example but whatever you do, this will be adding some carbs. Just keep it to a minimum. 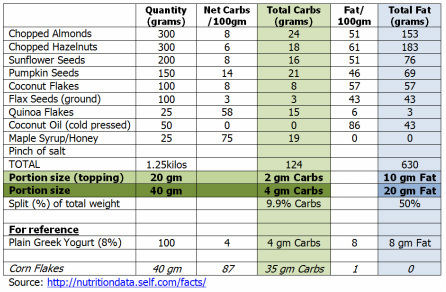 If you've followed the master recipe listed above, 100 gm of your mixture contain 10 grams of carbohydrate; you'll need to add a further 5-10 grams of honey to get the mixture clumping together, but then... although it's still very healthy, it should be eaten in small quantities. I recommend natural Greek yogurt unsweetened, with a generous 20 gm topping of granola and a few berries. It will still contain less than 10 grams of carbs per complete portion and it's both delicious and nutritious. For this Swiss classic, soak a portion of the roasted muesli mix in yogurt, milk or fruit juice, overnight in your fridge. In the morning, add a small amount of fruit of your choice including thinly sliced apples for that authentic Swiss touch. Tastes vary so you'll need to experiment to get just the right soaking mixture in the right quantity for your palate. It will taste soggy but it's healthy and easier on the digestion than un-soaked mueslis and granolas.